occurring substances, such as androgenic steroids, prohormones and related metabolites, peptide hormones, as well as the emergence of designer drugs and the manipulation of blood and blood components results in sports drug testing methods which are capable of a range of tests. 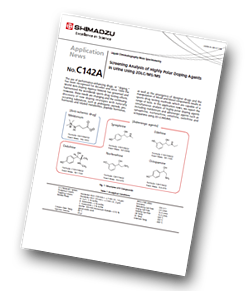 In this application news, the simultaneous analysis of highly polar doping agents including meldonium and adrenergic agents such as synephrine, norfenefrine, etilefrine, oxilofrine and octopamine using 2D LC/MS/MS is reported. The application demonstrated that in all samples, both the unchanged form and sulphated metabolites were detected. Click below to view the full application note.